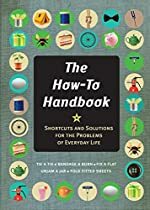 The How-To Handbook: 50 Essential Life Skills for Everyday Life by Martin Oliver & Alexandra Johnson. Review: Can you do all of the simple things in life like wash a car or do the dishes? The How-To Handbook tells you how to do all of that and a lot more. It's ok if you don't know how to do simple tasks like that. That is what The How-To Handbook is here for. In The How-To Handbook by Martin Oliver and Alexandra Johnson, readers learn how to do simple chores like doing the laundry, making a smoothie, treating a burn, and wrapping a gift. In The How-To Handbook there are a lot of different things under 6 categories. There is the Everyday Essentials, which explains how to catch a spider and prepare for a test. The next section is about looking (and smelling) good. This is where you are able to learn how to get a good night's sleep and to soak up the sun but not get burned. All of the other sections have similar topics that some people don't know how to do. This book is full of great tips and instructions of how to do the easy things in life that can sometimes become difficult. So if you don't know how to do something easy like wash your hands, don't feel bad for yourself, read The How-To Handbook to find out how. I loved The How-To Handbook. This book has a lot of information. It gives really good details about how to make things a more easily. You should read this book if you need a refresher on how to do the basic things in life or if you just don't know how to do something like wash your car. Even if you think you know how to do all of the simple things, this book will show you at least one task that you thought you knew how to do but you really don't. No matter what you want to do when you get older, this book is great for you because it teaches what to do when there is a problem. In fact, it is a great book for anyone. No matter what you think about this type of book, The How-To Handbook really is a tool for learning about the simple things in life. We would like to thank Zest Books for providing a copy of The How-To Handbook: 50 Essential Life Skills for Everyday Life for this review. Have you read The How-To Handbook: 50 Essential Life Skills for Everyday Life? How would you rate it?